Playa Saldamando is located at kilometer 94, off the Tijuana/Ensenada Toll Road. They are approximately 55 minutes South of Tijuana or 10 minutes North of Ensenada, next to the Pacific Ocean and is a beautiful place for families to relax. Playa Saldamando has over one mile of coastal property, all fenced and gated to enhance your security. Playa Saldamando has employees on the property 24 hours/7 days a week to provide you friendly service. 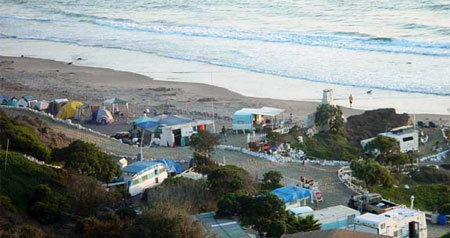 When camping at Playa Saldamando in Ensenada they offer private campsites available on the beach and on the cliffs above. All sites have beautiful ocean views, all lined with white rocks, a ramada for shade, picnic table, fire-ring, bar-be-que ring and some very large sites, which can accommodate large groups. They do not have "hook-ups" therefore, Motorhomes will be "dry-camping", however they do have water in case you run low. Playa Saldamando takes pride in our clean, maintained camping areas and our clean restrooms with flushing toilets and showers. Activities include Water activities such as swimming, surfing, kayaking, boogie -boarding and snorkeling as well as beach volleyball. Location: Playa Saldamando is located at kilometer 94 approximately 55 minutes South of Tijuana. It is located about 10 minutes north of Ensenada.